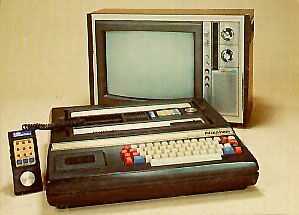 This was the original keyboard component which Mattel planned to use to turn the Intellivision Video Game System into a Home Computer. The trouble was they could never get the cost down to a level where they could sell it so it wasn't released. But, due to continued fines levied by the FTC brought on by consumer complaints, Mattel produced a few and sold them to the biggest complainers, thus there are a very small number of these out there. Later, Mattel released a new keyboard unit to go along with the Intellivision II system but it never lived up to the promises of this first system. I know this is a REAL shot in the dark, but on the off chance you have one I could acquire from you, my email address is nospam212-trailingedge@yahoo.com.